A cyst is defined as a pathological cavity which may or may not have an epithelial lining and which has a fluid, semi-fluid, or gaseous content and is not formed by the accumulation of pus. Calcifying odontogenic cyst, as Gorlin cyst was recognized earlier, was first reported by Gorlin et al. in 1962. At that time, it was classified as a cyst related to an odontogenic apparatus. It was later renamed as calcifying cystic odontogenic tumor (CCOT) in the World Health Organization classification devised in 2005 due to its histological complexity, morphological diversity, and aggressive proliferation. CCOT was later recognized by numerous names including Gorlin cyst, calcifying ghost cell odontogenic cyst, and dentogenic ghost cell tumor. The present case report presents a case of the same in a 21-year-old female which was diagnosed as Gorlin cyst during the diagnostic workup. Gorlin cyst which is also known as calcifying odontogenic cyst (COC), calcifying cystic odontogenic tumor (CCOT), calcifying ghost cell odontogenic cyst, and dentogenic ghost cell tumor, is a rare developmental lesion that arises from the odontogenic epithelium and represents about 2% of all odontogenic pathological changes in the jaw.,,, It is clinically characterized as a painless, slow-growing tumor which equally affects the maxilla and mandible, has a predilection for the anterior region of the jaw bones, and usually arises intraosseously although it may occur extraosseously too. It has a peak incidence during the second and third decades of life with a mean age of 30.3 years and does not demonstrate any gender predilection. 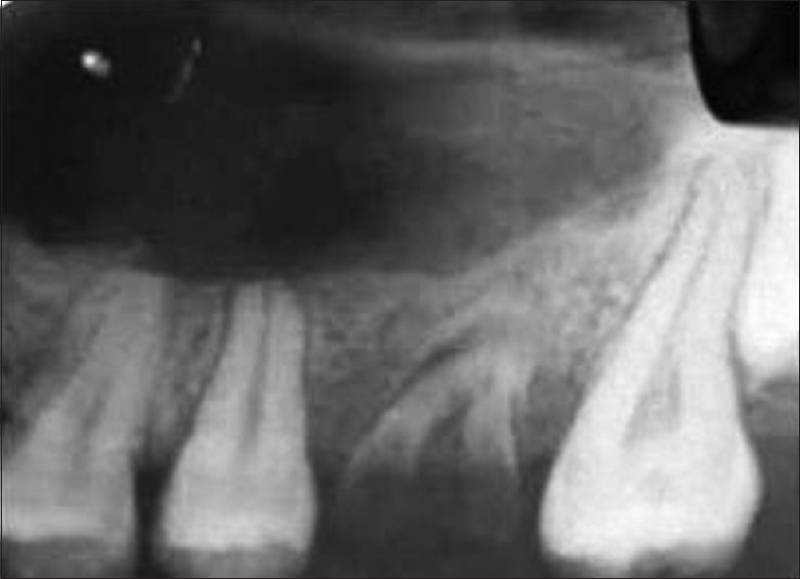 Radiographically, Gorlin cyst may appear as a unilocular or multilocular radiolucent lesion with either well-circumscribed or poorly defined margins and may also be observed in association with unerupted teeth. Calcification is an important radiographic feature for the interpretation of Gorlin cyst but is detected in only approximately half of the reported cases. The typical histopathological features of CCOT include a fibrous wall and lining of odontogenic epithelium with either columnar or cuboidal basal cells resembling ameloblasts. Stellate reticulum-like cells overlay the basal cell layer while ghost cells, which may occasionally become calcified, are also seen in the lining of the cyst. The treatment of choice for Gorlin cyst is conservative surgical enucleation. However, recurrence is frequent especially, in neoplastic cases, such as dentogenic ghost cell tumors. A 21-year-old female patient reported to the Department of Oral Medicine and Radiology, with a chief complaint of swelling in the upper left front tooth region since 6 months with a history of discomfort due to the swelling while no associated pain was reported. 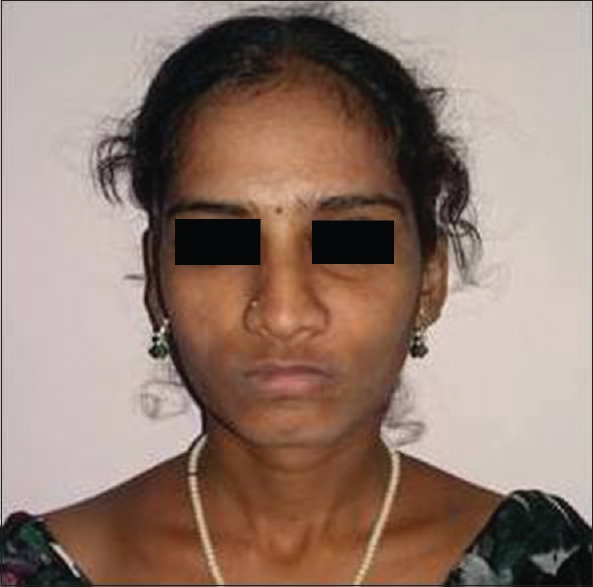 On extraoral examination, a gross asymmetry over the left middle-third of the face [Figure 1] and [Figure 2] was seen which was with poorly delineated margins, 3 cm × 3 cm in greatest dimensions, hard in consistency, and nontender on palpation with retained 63 with missing 23. Vestibular obliteration in relation to 22, 23, 24, 25 region was noted with egg shell crackling on palpation [Figure 3]. Fine needle aspiration cytology was performed and was positive yielding a 3.8 ml of straw-colored fluid [Figure 4]. Intraoral periapical radiograph [Figure 5] and maxillary left lateral occlusal radiograph [Figure 6] revealed a well-defined periapical radiolucency extending from 22 to 26 region with root resorption in relation to 63, 24 and 25. Orthopantomograph revealed a well-defined radiolucency extending from 22 to 26 region associated with an impacted 23 and root resorption in relation to 63, 24, and 25 [Figure 7]. Based on the history, clinical, and radiographic examination, a provisional diagnosis of dentigerous cyst in the left anterior maxilla with differential diagnoses of adenomatoid odontogenic tumor, unicystic ameloblastoma, and Gorlin cyst was considered. Complete surgical enucleation of the cyst was done and was sent for histopathological examination. Histopathological examination revealed a cystic epithelium of variable thickness along with the presence of ameloblast-like cells, stellate reticulum-like cells, and ghost cells along with numerous bundles of collagen fibers associated with subepithelial hyalinization confirming to a histopathological diagnosis of Gorlin cyst [Figure 8]. COC, as Gorlin cyst was recognized earlier, was first reported by Gorlin et al. in 1962. At that time, it was classified as a cyst related to the odontogenic apparatus. The lesion has some features of a cyst while some features of a solid neoplasm making the lesion a little controversial and actually comprising two entities, a cyst and a neoplasm. Although it has commonly been recognized as a benign odontogenic cyst since its original description by Gorlin et al. in 1962, this pathologic entity encompasses a spectrum of clinical behaviors and histopathological features including cystic, neoplastic, and aggressive variants. As a result of this diversity, different classification schemes and nomenclatures for this type of lesion have been suggested. It was, later, renamed as CCOT in the World Health Organization (WHO) classification for head-and-neck tumors devised in 2005 due to its histological complexity, morphological diversity, and aggressive proliferation. Gorlin cyst is, now, a well-recognized pathological entity; however, it is not very commonly encountered. This lesion manifests either as a central or a peripheral variant, the central variant being more common. Praetorius et al. (2005) suggested the bimodal age distribution. The lesion may affect over a wide age range from 1 year to 82 years, while second decade is the most common for occurrence. There is a negligible difference in gender predilection with no identified racial predilection. Mandible and maxilla were involved with almost equal frequency. Li and Gao reported that maxilla was more frequently affected than the mandible while the most common site of occurrence of the lesion is canine-premolar region of the maxilla. In the mandible, several cases have crossed the midline, but this is less frequently seen in the maxilla. The demographic data recorded in the patient are in accordance with the reported literature as it affected anterior maxilla in a female patient who was in her second decade. Most of the peripheral lesions have been reported in the maxillary or mandibular gingiva and/or alveolar mucosa anterior to the first molar, while the central lesions are seen in the form of asymptomatic swellings as was seen in the present case producing a hard bony expansion; however, fairly extensive lingual expansion may sometimes be observed. Occasionally, Gorlin cyst may perforate the cortical plate as in the present case and extend into the soft tissues. Sometimes, the cyst may, also, displace the adjoining teeth. Occasionally, few cysts have been completely asymptomatic and discovered during routine radiographic examinations. Extraosseous lesions tend to be pink to red, well- or ill-circumscribed, elevated masses, measuring up to 4 cm in diameter. Because this lesion arises in the tooth-bearing areas of the jaws, radiographically, they appear as unilocular or multilocular radiolucencies with calcifications of variable density in one-third to one-half of the cases reported. The radiolucent lesions often show regular outline while may be irregular and have poorly defined margins. 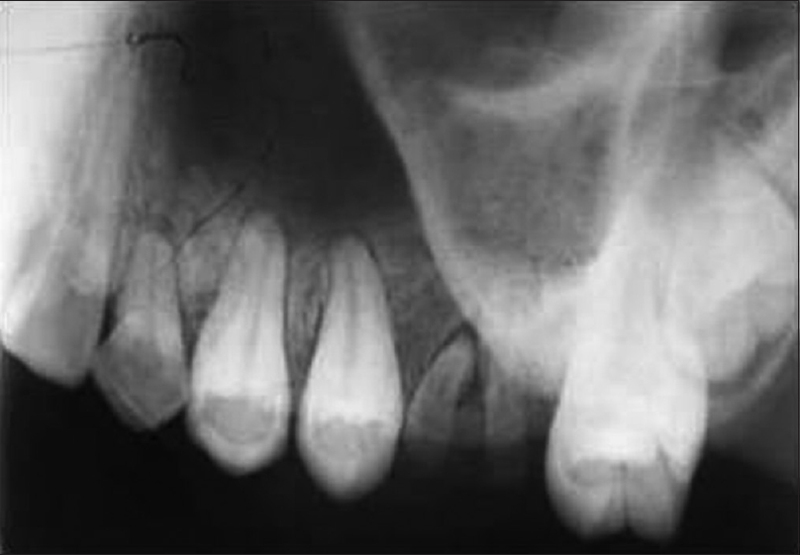 Root resorption and divergence of the adjacent teeth are the common radiological findings and association with an impacted tooth occurs approximately in one-third of the cases as was seen in the present case. However, the present case did not show radiopacities as an evidence of calcification with the conventional radiography. 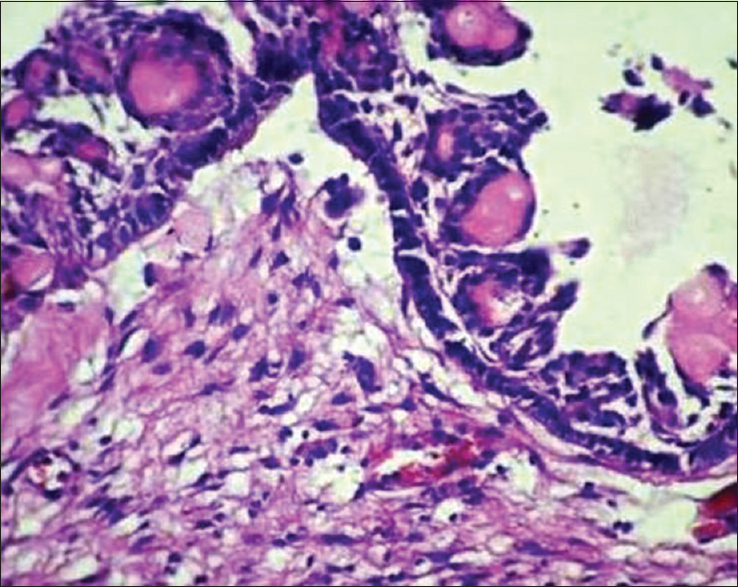 As defined in the WHO classification of 1992, it is a cystic lesion in which the epithelial lining shows a well-defined basal cell layer of columnar cells with stellate reticulum-like cells overlaying the basal cell layer while ghost cells seen occasionally in the lining of the cyst or in the fibrous capsule. The ghost cells may occasionally become calcified while a layer of dysplastic dentin may be laid down adjacent to the basal cell layer of the epithelium. The present case also showed the presence of ameloblast-like cells, stellate reticulum-like cells, and ghost cells along with numerous bundles of collagen fibers associated with subepithelial hyalinization. The epithelial lining of Gorlin cyst appears to have the ability to induce the formation of dental tissues in the adjacent connective tissue wall. The ghost cells represent an abnormal type of keratinization and have an affinity for calcification. The epithelium may be regular 6–8 cell layers thick over part of its length and be continuous with parts that may be very thin and others that are considerably thickened. Budding from the basal cell layer into the adjacent connective tissue and epithelial proliferations into the lumen are also frequently reported. Melanin deposits are sometimes present in the epithelial lining. In the fibrous wall, stellate reticulum-like cells, odontogenic epithelial islands, and ghost cells are appreciated. Taka et al. (2000) and Kusama et al. (2005) reported that the cytoplasm of the ghost cells in Gorlin cyst demonstrated distinct immunolocalization of the enamel-related proteins and enamelysin. Yoshida et al. (2001) confirmed the presence of amelogenin protein in the cytoplasm of the ghost cells. Fejerskov and Krogh demonstrated the fine tonofilaments separated by small empty spaces in the cytoplasm of some ghost cells. Most of the cells showed very thick, electron dense, fiber bundles of relatively uniform size, sharply defined against the large empty spaces in the cytoplasm. Endoplasmic reticulum, mitochondria, Golgi apparatus, and ribosomes could not be identified. The cell membranes were intact with junctional complexes of various types. Enucleation is the choice of treatment for most intraosseous Gorlin cysts similar to the treatment provided in the present case; however, few recurrences have been reported in the literature. Though rare, Gorlin cyst should be considered in the differential diagnosis of the swellings of intraosseous origin in the maxillofacial region and anterior maxilla, in particular. A thorough clinical, radiological, and histological evaluation must be carried out and treatment should be planned accordingly. A regular follow-up protocol should be established to rule out any evidence of recurrence and malignant transformation. Gamoh S, Nakashima Y, Akiyama H, Shimizutani K, Sanuki T, Kotani J, et al. A unique case of a calcifying cystic odontogenic tumor. J Stomatol 2013;3:314-7. Gorlin RJ, Pindborg JJ, Clausen FP, Vickers RA. The calcifying odontogenic cyst: A possible analogue of the cutaneous calcifying epithelioma of Malherbe: An analysis of fifteen cases. Oral Surg Oral Med Oral Pathol 1962;15:1235-43. Chindasombatjaroen J, Kakimoto N, Akiyama H, Kubo K, Murakami S, Furukawa S, et al. Computerized tomography observation of a calcifying cystic odontogenic tumor with an odontoma: Case report. Oral Surg Oral Med Oral Pathol Oral Radiol Endod 2007;104:e52-7. 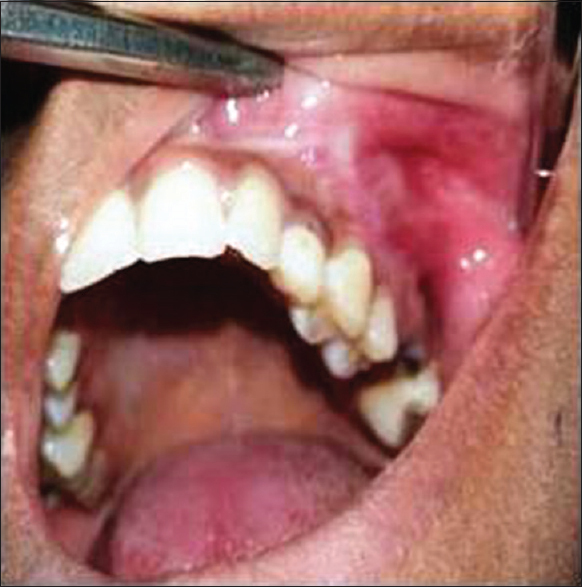 Verbin R, Barnes L. Cysts and cyst-like lesions of the oral cavity, jaws and neck. In: Barnes L, editor. Surgical Pathology of the Head and Neck. 2nd ed. New York: Marcel Decker; 2001. p. 1437-555. Kamboj M, Juneja M. Ameloblastomatous Gorlin's cyst. J Oral Sci 2007;49:319-23. Sakai VT, Filho CE, Moretti AB, Pereira AA, Hanemann JA, Duque JA. Conservative surgical treatment of an aggressive calcifying cystic odontogenic maxillary tumor in the young permanent dentition. Pediatr Dent 2011;33:261-5. Kler S, Palaskar S, Shetty VP, Bhushan A. Intraosseous calcifying cystic odontogenic tumor. J Oral Maxillofac Pathol 2009;13:27-9. Marques YM, Botelho TD, Xavier FC, Rangel AL, Rege IC, Mantesso A. Importance of cone beam computed tomography for diagnosis of calcifying cystic odontogenic tumour associated to odontoma. Report of a case. Med Oral Patol Oral Cir Bucal 2010;15:e490-3. Praetorius F, Piatelli A. Odontoma. In: Barnes L, Eveson JW, Reichart P, Sidransky D, editors. WHO Classification of Tumors, Pathology and Genetics: Head and Neck Tumors. 5th ed. Lyon: IARC Press; 2005. p. 314. Li BB, Gao Y. Ghost cell odontogenic carcinoma transformed from a dentinogenic ghost cell tumor of maxilla after multiple recurrences. Oral Surg Oral Med Oral Pathol Oral Radiol Endod 2009;107:691-5. Knezevic G, Sokler K, Kobler P, Manojlovic S. Calcifying odontogenic cyst: Gorlin's cyst - Report of two cases. Coll Antropol 2004;28:357-62. Nosrati K, Seyedmajidi M. Ameloblastomatous calcifying odontogenic cyst: A case report of a rare histologic variant. Arch Iran Med 2009;12:417-20. Fejerskov O, Krogh J. The calcifying ghost cell odontogenic tumor - Or the calcifying odontogenic cyst. J Oral Pathol 1972;1:273-87.